To maintain vendor neutrality while proposing Cloud solutions for our clients, we spend significant amount of time and effort to compare and contrast various Cloud Service Providers (CSPs) and their solutions. Recently, I had the opportunity to attend an all day IBM event covering a broad range of IBM and its partner SmartCloud and traditional IT solutions update. Our evaluation criteria is driven by many factors such as technology readiness, pricing models, security, support, SLAs, etc. We reviewed and analyzed the information that we received during and after the IBM event and positioned it within our PCI Cloud Cube framework. For those who may be new to our Cloud Cube, we use the cube to simplify your application (workload) journey to the Cloud. For example, each of your workloads will likely have a different set of requirements in the areas of security, performance, and availability. Those requirements determine where in the Cloud Cube that workload belongs. What makes the Cloud work is having a deep understanding of the myriad of options so you can select the correct space, or more likely, spaces, in the Cloud Cube for you. This will ensure that you can transition into, around in, and out of the Cloud without disrupting your business and still maintain the appropriate level of security for you and your customer’s data with the right performance and availability characteristics to allow your business to scale up or down. Our processes are driven by focusing on workloads and their inter-dependencies. IBM's primary focus remains on the enterprise requiring business and mission critical workloads with stringent SLAs. This focus is used to develop, deliver, and support a broad portfolio of Cloud and traditional IT services and solutions. IBM Cloud Managed Services (CMS) include SmartCloud supporting IaaS and PaaS services across Public, Private or Hybrid Cloud delivery platforms. 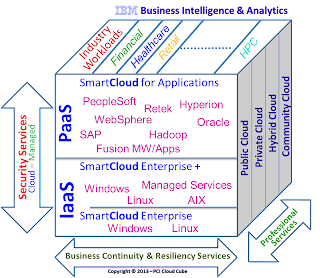 SaaS services are provided primarily by IBM partners. Security services are offered both in the Cloud and as managed services. With IBM having solutions and partners across both security and business intelligence (BI), we can expect security solutions leveraging of information and analytics from BI and vice versa. Business continuity and Resiliency Services (BCRS) cover a wide spectrum of RPO/RTO requirements with SLAs. This service includes SmartCloud backup, virtual server recovery, email continuity, hot site and work place recovery. Now, few words on the state of Cloud adoption process. As we know, most data centers adopting private, public, or hybrid cloud platforms need to either own or acquire traditional IT hardware/software. Depending on the data center complexity and its business driven requirements on optimization, flexibility, security, and automation, the process of selecting the right Cloud solutions with traditional IT products and services that are collectively aligned to best meet changing business needs can be a challenge. Even if a data center has virtualized most of their workloads with the intent to move them to the Cloud, the move can still require significant planning, cost and time. We are often asked, "how do we get started with the Cloud". While there are many new or some existing workloads that can be moved rather easily to the Cloud, there are others that require analysis, planning, implementation, reviews and on-going support. A well thought out methodology and plan can help and save cost and time. As key Cloud solutions, services or platforms are launched and delivered, we share our vendor specific Cube planning frameworks such as Microsoft Azure, Mobile Cloud, etc. with our clients and interested communities.We will continue to update and fine tune our methodology and Cloud Cubes. Please let us know your thoughts and experiences as you leverage the cloud.